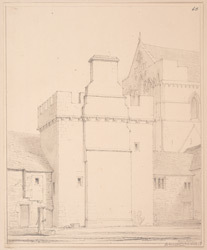 This drawing is a detail from the exterior of Lanercost Priory in Cumbria. Lanercost was founded as an Augustinian priory in 1169 by Robert de Vallibus. Although the building endured a peaceful early existence, it eventually came under attack by the armies of Willam Wallace and Robert the Bruce during the turbulent 14th century. Following the Dissolution of the Monasteries in the 1530's, Lanercost was given to the wealthy Dacre family, who remained in charge until 1716. Since then the site has gradually fallen into decay. The south portion of the priory is the oldest, being Norman in style. The north and west are predominantly 13th century Gothic, characterised by elegant Lancet windows.